Wet n Wild is an affordable and cruelty free makeup line. They can be found at Walmart and Rexall in Canada and have a huge selection on their website; but, the shipping from their website can be a little expensive to Canada. Wet n Wild Color Icon Lipgloss in "Scorpio" ~ $2.99 US. Embrace your star sign with an ultra-pigmented lip gloss hue that’s just for you. Swipe on for a mirror-like shine that embraces the beams of your rising sign. Argan, Macadamia, and Jojoba Oils keep your lips soft and moisturized for a perfectly kissable pout. Each lip gloss in the collection is really unique; but, I love how fun Scorpio is! It is a deep purple with shimmer in it! I found this shade a really interesting choice for Scorpio - it is a sign generally associated with a rich red or deep burgundy; but, it's actually a nice change. It's still a deep, rich colour so it can still be related to the Scorpio sign! It applies really interesting - this is Scorpio Color Icon Lipgloss over my natural lips. It isn't a full coverage lipgloss; but, this could make a great lip topper and can be added to any lip look for a really unique finish! Wet n Wild MegaGlo Loose Highlighting Powder in "Written in the Stars" ~ $6.99 US. Illuminate your inner aurora! Brush on a luminous sheen with high-impact glow for radiant cheekbones and an all-over shimmer thanks to this highlighter’s iridescent pearls. This buildable formula is silky to the touch and blends into the skin for an otherworldly gleam. I have to apologize that this product is sold out online; but, I still wanted to share this because it may still be in stores or on other websites, so if you are interested keep your eye out for it. Also, I still wanted to include this because I needed to try a loose highlighter after seeing the sold out, limited edition Goth-o-graphic loose highlighter powder from Wet n Wild. I do think it's weird that there are so many collections that are limited edition, it would be nice to see a highlighter like this in their regular line! Here is Written in the Stars swatched heavily, then really smoothed out underneath. It is a gorgeous highlighter - super illuminating and glowy on the skin! It is shimmery and slightly sparkly but not in bad way! Also, I absolutely love the packaging - the details and the star openings are lovely! Here is a look at the highlighter close up - it is so pretty! Also, this highlighter is huge and there is so much product! 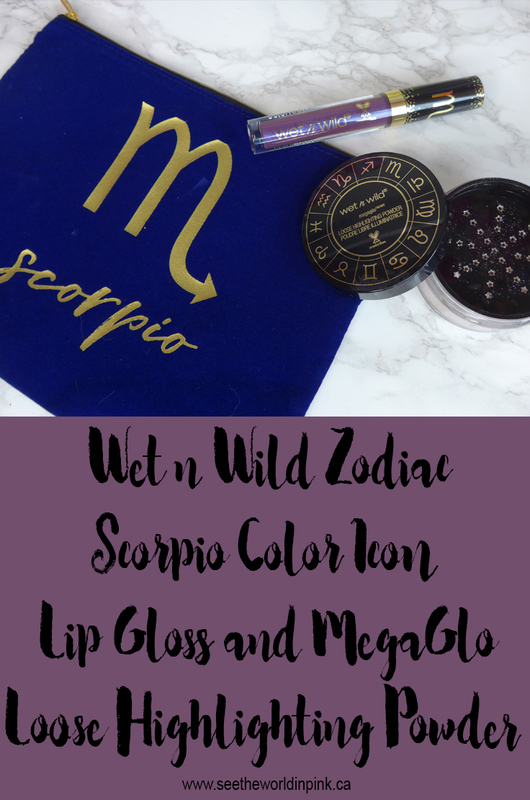 And, here is a look at the Wet n Wild Zodiac products on me - I have the Scorpio Color Icon Lip Gloss on and the MegaGlo Loose Highlighting Power in Written in the Stars on! I'm really happy with both of these products! Oh wow - that lip gloss looks incredible on you! The tones in it are wild, eh? So frigging cool! Their loose highlighters are also my favourite - I can't believe how stinking pretty they are! Thank you Chelle! Your reviews on the Goth-o-graphic loose highlighter made me feel like I could not miss this one! And, it's gorgeous!! I love both on you, they look SO good! I'm a scorpio too!! B-days are coming up! Thanks Melanie! I was really impressed with both products! Oh yay - birthdays are soon! I'm also excited to see what Bite will release for Scorpio - I love these zodiac releases! That lip gloss is so gorgeous on you!! I love it! Thank you! It's so different from what I normally go for; but, I really like it! Wow that lip gloss is gorgeous!! Thank you! Such a unique shade - I really like it! Oh my gosh this is so pretty on you. I really wanted the virgo one but it was all sold out . I hate how limited edition this collection was - everything seemed to sell out quickly!